Criminal Justice Services Supervisor Shawn McNamara recognized CJSD Manager Steve Chin on behalf of the Colorado Pretrial Association. Steve Chin was recognized for his work as President of the Colorado Association of Pretrial Services (CAPS) from 2014-2018. During his time as president, the committee worked on statewide validation of the Colorado Pretrial Assessment Tool (CPAT) with the collaboration of the University of Northern Colorado. Steve was also involved in the development and implementation of statewide standards for Pretrial. These efforts in Colorado have been recognized nationally. Steve Chin's leadership and service are greatly appreciated. Congratulations, Steve! CJSD Case Manager Dave Wetherald is immersed in caseload review to assess clients' progress and needs. Is that a Stormtrooper on his desk? Yes. Yes, it is. CJSD Shift Supervisor Eli Stemrich fills out forms and gets ready to collect a urinalysis (UA) sample for drug testing. Department of Human Services Case Manager Sandy Sebold celebrates her 38th work anniversary with DHS. 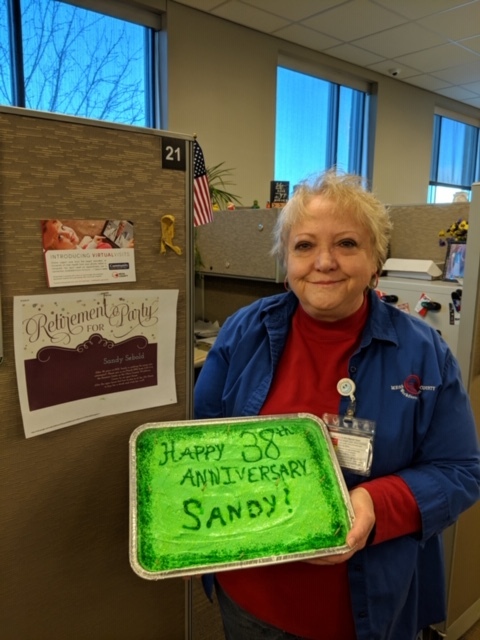 Sandy will be retiring on April 1, 2019. Congratulations, Sandy! On the re-opening day of the Fruita satellite office for the Department of Motor Vehicle (DMV), Beth Lillie sits at her desk with a big smile and is ready to help customers. Don Clement, Customer Service Specialist - LEAD, is one of the friendly faces at the Fruita DMV. The ribbon cutting ceremony hasn't even begun, and Fruita DMV staff members are already busy helping customers. Before the ribbon cutting got underway, the staff had already served four customers. Mesa County Clerk and Recorder Tina Peters excitedly cut the ribbon to officially open the Fruita DMV. 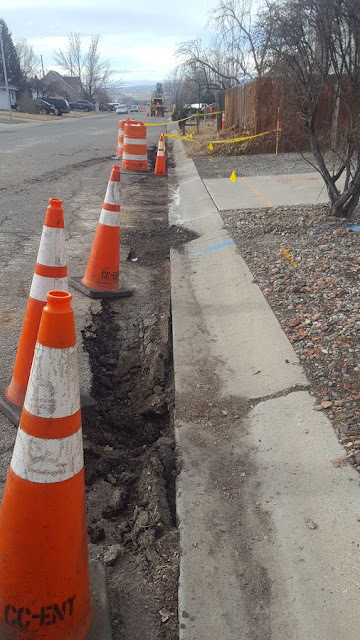 The office is located inside Fruita City Hall at 325 E. Aspen and is open Tuesdays and Thursdays, 8 a.m. to 5 p.m.
Mesa County Engineering Department is working on a drainage improvement project on E. Lynwood St. The stormwater pipe is old and deteriorated. A new storm drain will be installed. Let Solid Waste Management get you summer ready! With warming temperatures, you might be thinking about clearing out the garage or getting your yard ready for summer. 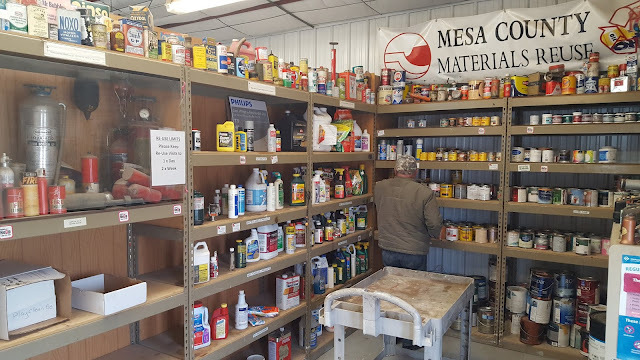 Did you know that Mesa County Solid Waste Management Campus offers many services to help you tackle that to-do list? Learn more at https://bit.ly/2Jv9of8. Mesa County Treasurer Sheila Reiner, and former Mesa County Clerk and Recorder, speaks about the election reform over the past twenty years at Ted X Grand Junction on Saturday, March 9. On the afternoon of Pi Day, Mesa County Information Technology (IT) personnel got together over the lunch hour to share project updates and pie. Mesa County IT staff enjoys pie on Pi Day (3.14). 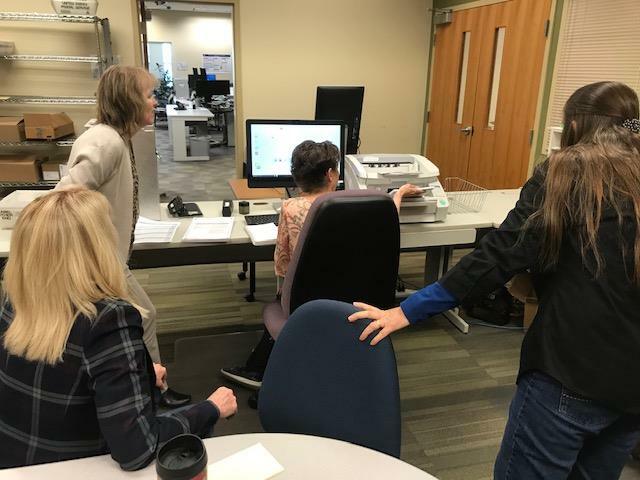 On Tuesday morning, Mesa County Elections conducted a ‘Logic and Accuracy’ test to confirm voting equipment being used in the current City of Grand Junction Municipal Election is functioning properly. Mesa County Coroner Victor Yahn gives a presentation to new nurses at St. Mary's Hospital to educate them about what is involved when a death needs to be reported to the Coroner's Office. Coroner Victor Yahn talks to nurses on how to accurately report a death to his office. 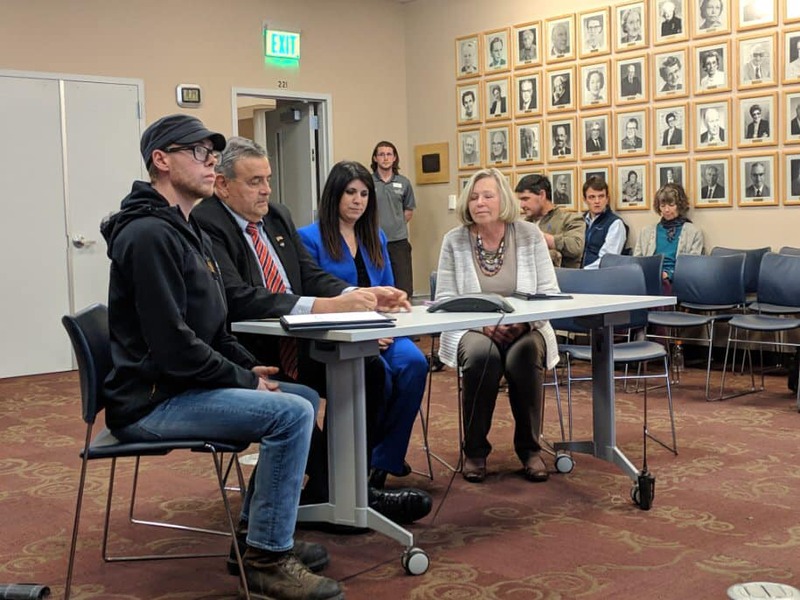 Mesa County County Commissioner Rose Pugliese (left) and President of the Grand Junction Area Chamber Diane Schwenke (right), patiently wait for their turn to testify remotely before the Colorado State Legislature in opposition to Senate Bill 181, concerning oil and gas operations. After a seven-hour wait, Commissioner Rose Pugliese (center) is finally able to give her testimony on Senate Bill 181 on behalf of the hard-working energy workers in Mesa County and their families who live in the Grand Valley. 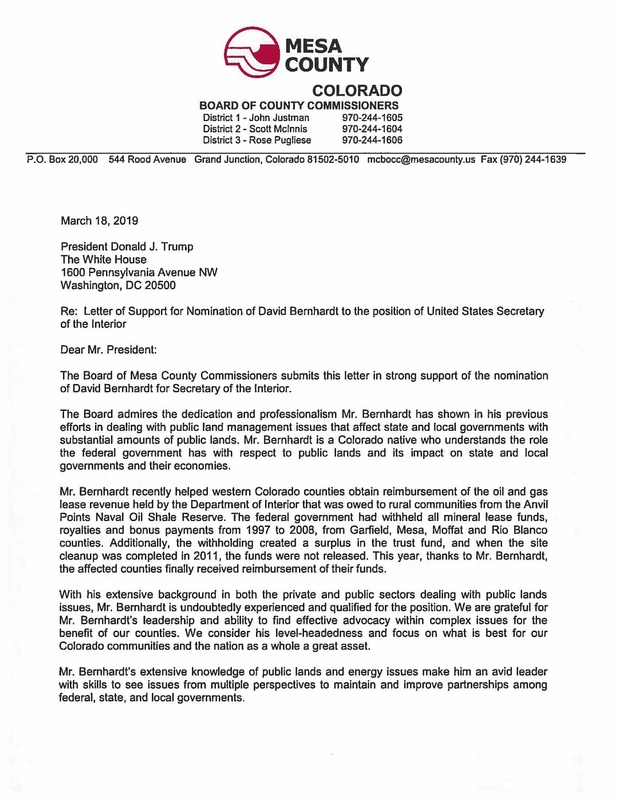 On Monday, March 18, 2019, the Board of Mesa County Commissioners sent a letter to President Trump urging him to appoint David Bernhardt to the position of United States Secretary of the Interior. Read more at https://bit.ly/2TXUAJX. 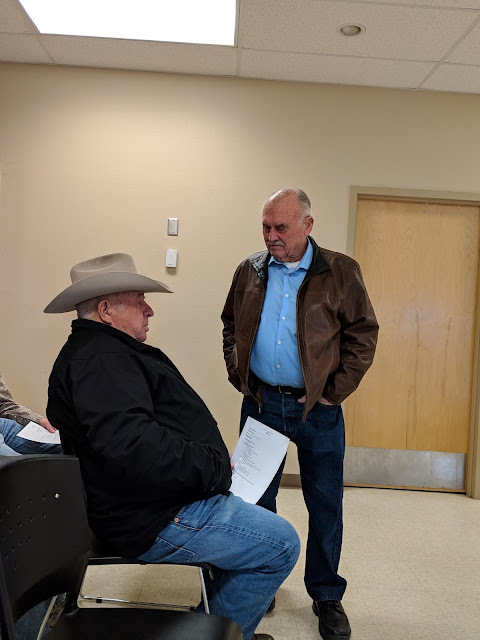 Mesa County Commissioner John Justman attended the Mesa County Fair Board meeting Thursday evening to discuss the upcoming county fair, which will be held July 17-20, 2019. 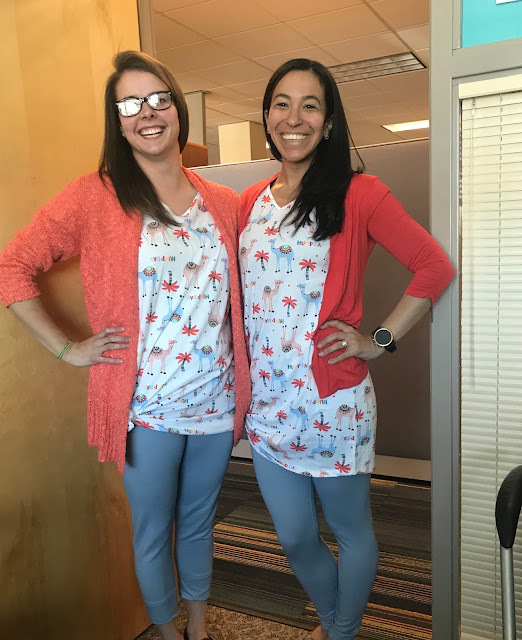 Department of Human Services had Twin Day on Wednesday as part of their spring break activities. Pictured here are Kiira Moore and Frances Hicks from the Child Welfare division. 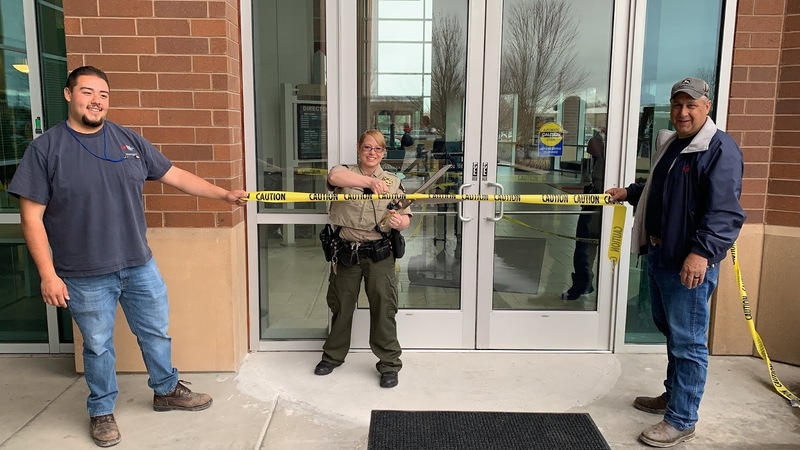 Maintenance Technician Christopher Trujillo (left) and Lead Maintenance Technician Dan Adams (right) hosted a ribbon cutting for the new front doors at the Justice Center, 125 North Spruce St. The entrance had been closed off for many months. The wait is over, new doors finally arrived and were installed at the Justice Center. Mesa County Sheriff 's Office Deputy Melissa Barney did the honors and cut the ribbon. Start the growing season off with a bang by visiting the Mesa County Organic Materials Composting Facility's Annual Spring Sale. Now through March 30 receive $10 off every cubic yard of Mesa Magic compost and $5 off of each purchase of a cubic yard of dark wood mulch. Give your lawn and garden the care they deserve! 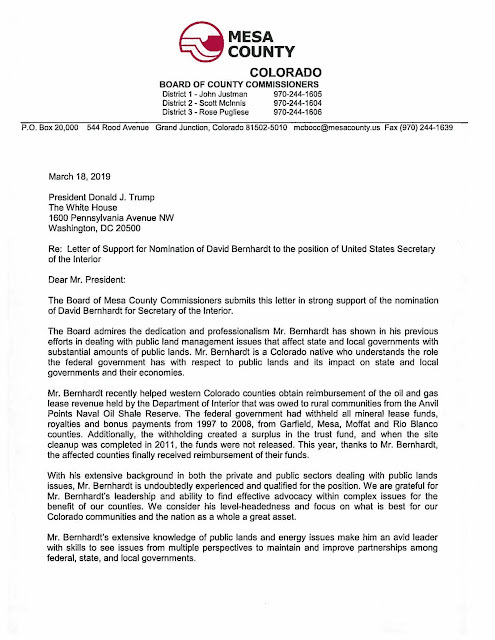 On Monday, March 18, 2019, the Board of Mesa County Commissioners sent a letter to President Trump urging him to appoint David Bernhardt to the position of United States Secretary of the Interior. The letter states: "The Board admires the dedication and professionalism Mr. Bernhardt has shown in his previous efforts in dealing with public land management issues that affect state and local governments with substantial amounts of public lands. Mr. Bernhardt is a Colorado native who understands the role the federal government has with respect to public lands and its impact on state and local governments and their economies. Mr. Bernhardt recently helped western Colorado counties obtain reimbursement of the oil and gas lease revenue held by the Department of Interior that was owed to rural communities from the Anvil Points Naval Oil Shale Reserve. The federal government had withheld all mineral lease funds, royalties and bonus payments from 1997 to 2008, from Garfield, Mesa, Moffat and Rio Blanco counties. Additionally, the withholding created a surplus in the trust fund, and when the site cleanup was completed in 2011, the funds were not released. This year, thanks to Mr. Bernhardt, the affected counties finally received reimbursement of their funds. With his extensive background in both the private and public sectors dealing with public lands issues, Mr. Bernhardt is undoubtedly experienced and qualified for the position. We are grateful for Mr. Bernhardt’s leadership and ability to find effective advocacy within complex issues for the benefit of our counties. We consider his level-headedness and focus on what is best for our Colorado communities and the nation as a whole a great asset. 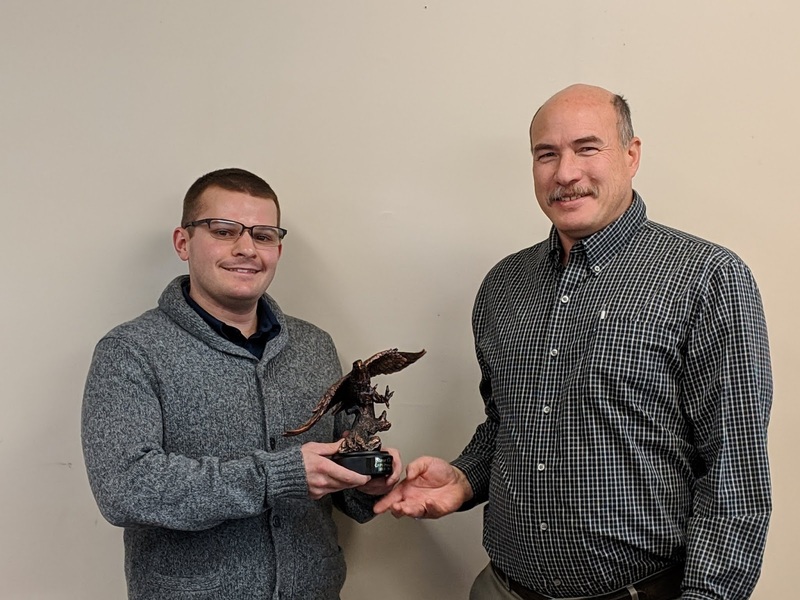 Mr. Bernhardt’s extensive knowledge of public lands and energy issues make him an avid leader with skills to see issues from multiple perspectives to maintain and improve partnerships among federal, state, and local governments. 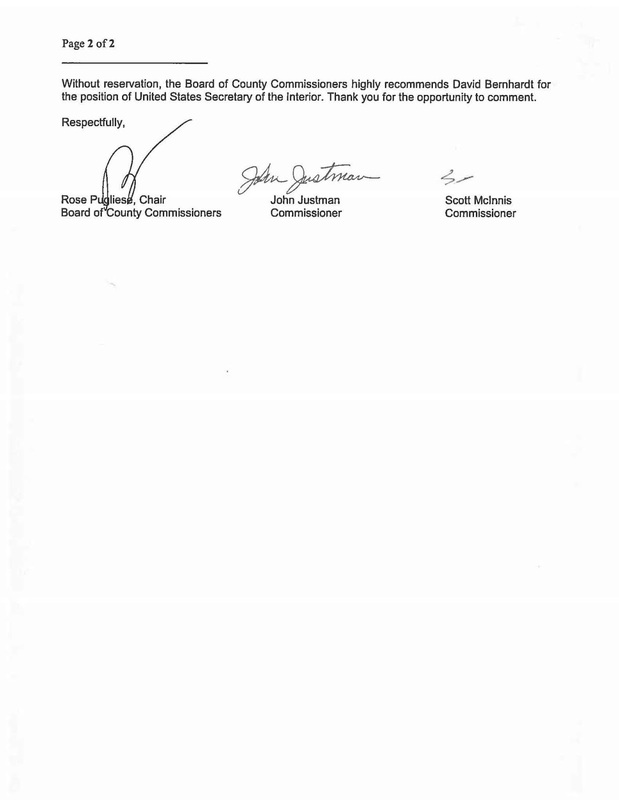 Without reservation, the Board of County Commissioners highly recommends David Bernhardt for the position of United States Secretary of the Interior. Thank you for the opportunity to comment."